Save-the-Date: Saturday, July 21st 9am-6pm, All Nations Apostolic Tabernacle Annual Health Fair, on the church grounds, at 89-28 Parsons Blvd., Jamaica, NY 11432. The Jamaica BID is excited to Co-Sponsor, All Nations Apostolic Tabernacle Annual Health Fair Block Party, Saturday, July 21st 9am to 6pm, bringing health and wellness to the community of Downtown Jamaica. 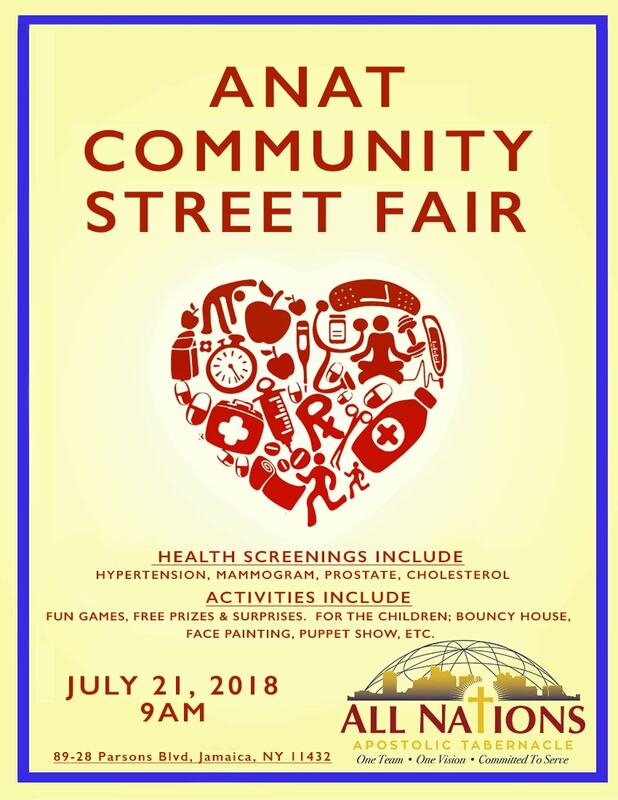 The purpose of our annual Health Fair is to provide access and a variety of services to the community, in which our Church (ANAT) serves. Our location within a multicultural Jamaica, Queens’s demography affords us a rich tapestry of cultures. Throughout the day our resource tables are actively providing multilingual information/incentives to families from cultures such as Latino, Hindu, Asian, Caribbean, African, European, and African-American. ANAT stands firmly and believes that the multicultural families in the Jamaica community trust the Annual Health Fair with: information tables, check their eyes for glaucoma, do hypertension screening, cholesterol and blood sugar testing, Prostate screening, neurology screening, Breast cancer education, check tables with healthy food choices, donate blood or stop to listen to our music and our choir, and to visit the Fire House. ANAT members assist in distributing packages of goodies including but not limited to yogurt, nutritional supplements, natural alternative sweeteners, or literature. On an annual basis, ANAT links with the following community-based organizations that support ANAT with their professional services, give-a-ways, and technical information and literature from: Cornel University Cooperative Extension Unit, New York City Child Enforcement Agency, New York City Department of Aging, New York City Department of Health Early Intervention Program, New York Fire Department, New York City Human Resources Administration Office of Food Stamp, New York City Police Department, New York University Pediatric and Adult Dental Unit, New York Blood Bank, Visiting Nurse Services, and St. Francis Hospital.